Hey friends! I am so glad its Friday - how about you!?! This week hasn't been bad, its just been long! The boys didn't have any school on Monday and lets just say all of our sleep schedules are messed.up.big.time. Glad its the weekend - and for once, I have nothing on the calendar! Back to scrappy things!! I made another layout for the Paper Issues 'What's Love Got To Do About It' theme. 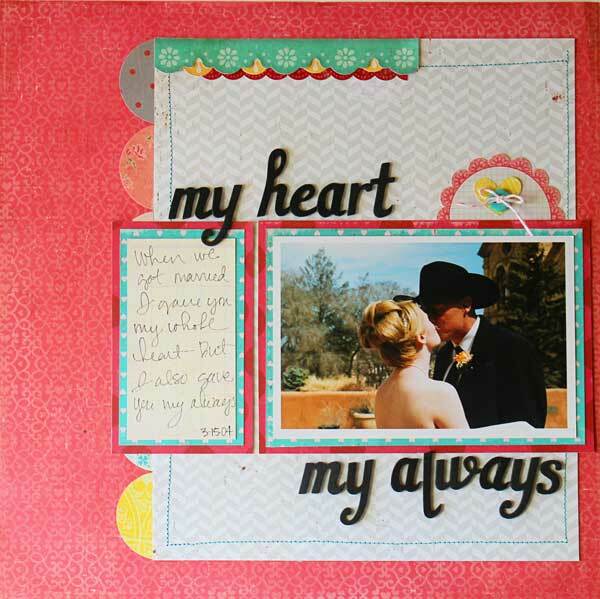 This time around, I pulled out some of Pink Paislee's Paper Heart collection. Truth: I have had this collection for a long while now. But I didn't think the colors or patterns were anything that I just loved. I was soooo wrong. I love this entire collection & actually want another whole set of it! The photo I used is one from right after Alex and I got married. *sigh* I loved my wedding day! We were married in Santa Fe and it was absolutely perfect! The journaling says: When we got married, I gave you my whole heart but I also gave you my always! Thats all I have today! I have been creating another layout + I have been working on a special series coming up on my blog (just in time for Valentines Day!). Busy times, around here!